During my ever vigilant countdown to spring (March 20th, respectively), I'm filled with thoughts of the first crop of veggies to sprout on our farm. 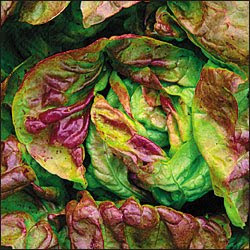 Lettuce, of course, is always in abundance during those first precious weeks of the season. In honor of one of the most overlooked and undervalued vegetables, I've written the following tongue-in-cheek ode to the humble head...if you click on the links of the names, you can learn more about each variety of lettuce. After putting on my Mascara (something The Farmer Babe never goes without) and driving down to the Farm, I stand among the raised beds and admire the seas of Red Coral, their red heads stand out from the brown of the earthy ground, along with the varied green shades of the kale and greens, along with others that are Speckled; in combination are highly reminiscent of a Pablo Picasso. I take the Tennis Ball I was carrying in my pocket, toss it to my left and yell to my dog, "Fetch!" Sadly, he is getting older and is therefore a Slobolt. His Amish Deer Tongue hangs languidly out of his mouth while he slowly, gingerly heads towards the direction in which I threw the ball. Without seeing his approach, our Humble Farmer suddenly grabs my hand and pulls me close to him for a quick Tango (he is rather dashing and spontaneous, after all). He admires what he calls my Yugoslavian Red hair. My face flushes, and is now the color of Red Velvet cake...as if I've been lit up from the inside by a Flame. After a quick, Crisp Mint(y) kiss, he returns to his plowing, while I continue to attempt playing fetch while admire the many colorful rows we've lovingly planted together. Underneath a head of Baby Oakleaf, I found a Bronze Arrowhead...something that my Grandpa Admire's. I feel as though I'm in a Gold Rush, and wonder what other treasures I can unearth during my adventure. Out of the corner of my eye, I thought I spied a Red Leprechaun...but quickly laughed at myself and dismissed this daydream. Turning back to the beds of heads, I marvel at the Merveille Quartre then I pick up the Tennis Ball, and head off with Fido into the Sunset, hoping for another Tango with my love the Humble Farmer, and suddenly hungry for a salad. Thank you, Stacey! In retrospect, it's pretty much a Mad Libs with heirloom lettuces...lol! Jen, do you happen to know what kind of lettuce is pictured at the top? Lucy, I did a little research and the variety is called Yugoslavian Red and is linked in the text. However, the photo that is above - and that we used for your 101 - comes from another web site and we don't have permission to use it. My bad. Should have checked before. Such pretty lettuce! You need to be a member of HOMEGROWN to add comments!